Complex mailshots are a challenge that we enjoy setting ourselves! In addition to requirements such as selective approaches to target groups and exceptional design, the aim is always to achieve the lowest possible costs and the shortest possible production times. Our lettershop has the solution! We would be very happy to help you. Using state-of-the-art technology and a skilled team, we get your mailshots off to a great start. 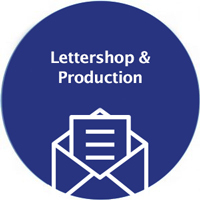 As a full-service provider, we will advise you on designing your mailshots, produce promotional materials to suit your preferences and ensure optimum and punctual distribution. 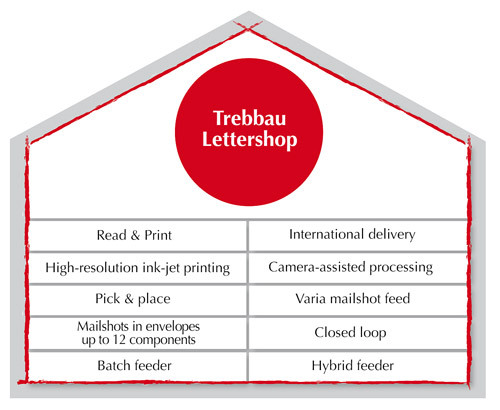 In our lettershop, our staff of over 70 employees uses intelligent processing systems to convert the skills garnered from decades of experience in dialogue marketing into advertising success for you. Why not take a look at the range available from our lettershop? You are sure to be impressed! Take advantage of Trebbau’s successful network of selected partners for producing your promotional materials. We combine our skills to ensure your dialogue marketing success. Whether you want a simple postcard or a presentation catalogue, you can be sure of optimum results! Do you want to send out a classic mailshot? Or do you have a more challenging VarioMail concept in mind? Why not take advantage of our many years of experience and our computer-operated, state-of-the art lettershop technology? Personalisation is a must; the exceptional individualisation of your mailshots, a matter of choice. You can, if you wish, assign different text and images to each individual recipient and make the approach still more personal. Experience has shown us that bespoke offers of this type result in a much higher response rate. A very interesting and creative way to enter into dialogue with your customers is the self-mailer. Find out all you need to know about the self-mailer and take advantage of the benefits it brings. Delivering mailshots, whether for the domestic or international market, is our daily business. We know the carrier market and the regulations, take care of all the details, and ensure that we never lose sight of the cost benefits for you. The most efficient way to ensure a targeted approach to your target group is a Postwurfspezial. Use this to your advantage to acquire or revive customers! Whether you need invoices, reminders, notifications or receipts for donations, at Trebbau printing and processing are quick and reliable. And, of course, we would be happy to provide you with a white paper solution.